Riverside Jazz will host our 6th Annual Jazz Night at Killarney’s Family Pub Saturday, March 23. 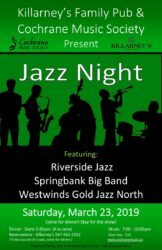 Riverside Jazz will be joined by Westwinds Gold Jazz North (Calgary) and Springbank Big Band for an evening of great music at Killarney’s Family Pub. It’s always a sold out show so ensure your seat by making a dinner reservation. To be assured of a seat, come for dinner!